"an activist, thriving foreign missionary movement by the early 1900s"
Religion, especially the dynamics of evangelical Protestantism, played an important role in the tasks of internal expansion and nation-building which occupied Americans in the nineteenth century. At the same time, early in the century American Protestants also took their first steps beyond our shores in the foreign missionary movement. For the first two thirds of the century this overseas movement was overshadowed by the focus of most American Protestant groups on the internal planting of churches on the advancing frontier, and on the Civil War. But after mid-century, as Americans looked out on the Pacific from newly acquired and recently settled California, and as the outcome of the Civil War seemed finally to settle the basic issues of slavery and national unity, the foreign missionary movement gathered momentum. By 1900, its expansion was in full bloom, and would continue well into the twentieth century, with its presence on all continents of the globe characterized by a distinctive American mixture of religious and national or "civilizing" purpose. One way to conceptualize this is to recall the old Puritan ideas of the 1600s, that their purpose was an "Errand into the Wilderness" to construct a "City on a Hill," a combined religious and national goal which was framed by the sobering admonition of John Winthrop that "the eyes of all people are upon us." Add to this the idea of an American "Errand to the World" in the nineteenth century. And then include the well-established American talent for the creation of religious voluntary associations and pragmatic, entrepreneurial problem-solving. 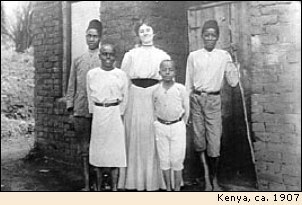 The result was an activist, thriving foreign missionary movement by the early 1900s. The missionary movement actually evolved through internal expansion before venturing overseas. The challenge of providing churches and ministers to growing towns in territories and states as settlers moved west was itself a daunting one. 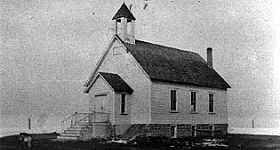 Methodists proved especially effective in missionizing and creating new congregations through their circuits and adaptable structures, but Baptists and Presbyterians also expanded westward. 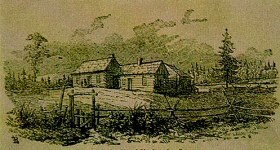 And the Mormons, an offshoot of Protestantism, provided a dramatic example of a uniquely American movement which combined sectarian religious zeal and a genius for settlement of a homeland in the American West. All in all this was a remarkable feat of internal religious expansion. Only in the far west, in the somewhat untypical conditions of California, was there distinctly less success in easterners' transplanting of Protestantism. In addition to the western frontier, later in the century home missions turned to America's growing cities as arenas of missionary effort, where the aim was to convert presumably benighted Roman Catholic and later Jewish immigrants to Protestantism. 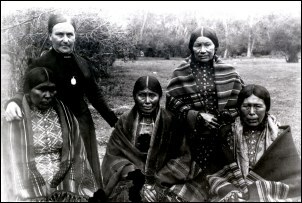 Presbyterian missionary Kate McBeth and Nez Percé women students, Idaho, late 19th c.
Ordained Nez Percé Presbyterian ministers, students of missionary Sue McBeth, Idaho, late 19th c.
Two further internal missionary efforts, both to non-European groups, framed and complemented the foreign missionary thrust. One was the continuation of missions to Native Americans, an effort already nearly three hundred years old. In the first third of the century this focused on the Cherokees of the southern highlands, and the fate of the missionary religious efforts there became a part of the tragic relocation of the Cherokees to the west, with several missionaries standing with the native Americans against the federal government. The entire story of Christian missions to the indigenous peoples of North America is a complex one, with both cultural resistance and religious conversion visible on the Native American side, and both arrogant high-handedness and cultural sensitivity, as well as some cases of courageous missionary solidarity with native peoples, visible on the missions' side. African-American slaves and, after the Civil War, freedmen, were another target of home missions. Hundreds of white and black missionaries went to the American south after the Civil War, where in addition to religious goals they tried to ameliorate the conditions of white racism and black poverty which still prevailed there despite the outcome of the war and the freeing of the slaves. Within this context of activist Protestant expansionism and mission efforts within the U.S., and as a direct extension of these home missions, the American foreign missionary movement developed. It began with the establishment in New England in 1810 of the American Board of Commissioners for Foreign Missions (ABCFM). Like its British counterpart which preceded it by almost two decades (the London Missionary Society), this was a nondenominational voluntary organization, not under the management of any ecclesiastical body. For nearly half a century the ABCFM directed the bulk of Americans' overseas missionary efforts, which still ranked second in priority to the task of settling and Christianizing the continental U.S.